There are currently 114,616 users on this website. 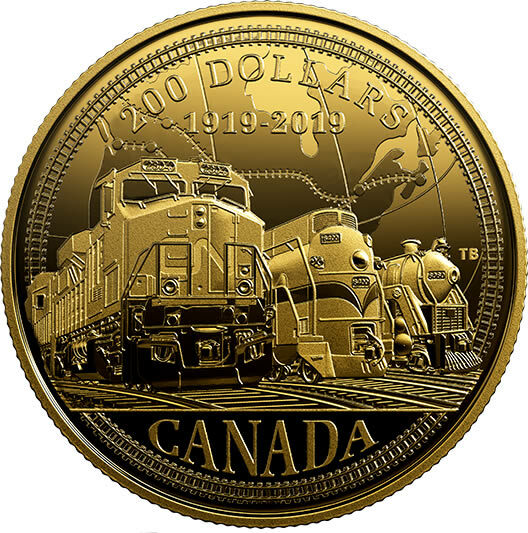 Royal Canadian Mint - Designed by Tony Bianco, your coin features a side-by-side view of three Canadian National Railway (CN) engines that have powered progress in Canada during the last 100 years. On the far right is No. 6060, one of the last Mountain steam locomotives delivered to CN. Next is Locomotive 6400, a class U-4-a Confederation steam locomotive that was used for the Royal Visit in 1939. In the foreground, CN 2304 is a GE ES44DC model that represents today's efficient diesel freight locomotives. Instead of denticles, train tracks circle the rim and frame a stylized map that alludes to the railway's impact across Canada. The reverse includes the face value "200 DOLLARS", the commemorative dates "1919" and "2019", and the word "CANADA". The obverse features the effigy of Her Majesty Queen Elizabeth II by Susanna Blunt.